How do we know where we’re going unless we know where we’ve been? Historians believe those words well enough to share some interesting stories with anyone who will listen. St. Anthony of Padua parish has had a long and varied history. The archive collection is currently housed in the rectory and provides a wealth of information—too extensive for most people to tackle. This column will try to present a précis of parish history by decades, just to take us on a brief journey through more than 140 years of history. Our initial offering began in 2013 by covering the years ending in “3” starting with 1873—a very important year in the story of St. Anthony’s. Thanks to the response and requests of our many faithful followers, we continue exploring our rich parish heritage by presenting the “4” years, starting at 1874. The goal is to continue with a vibrant, living archive collection. By sharing our research with you there is no better way to keep our history alive. Thank you for your continued support, and a special thank you to those who contributed new photos and details to supplement our ﬁles. Illustrations have been reproduced from originals contained in the parish archive. Other source credits have been duly given. 1873 in History Ulysses S. Grant is President; Levi Strauss invents jeans; the ﬁrst Heineken brewery is opened; the Woman’s Christian Temperance Union is formed (coinci-dence? ); the Jesse James gang robs its ﬁrst train after four years of planning (trans-continental railroad completed in 1869); HMS Pinafore opens. 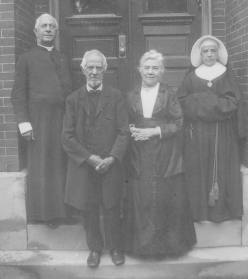 1873 at St. Anthony’s On August 29, 1873 two Holy Cross Sisters from the Mother House at St. Mary’s in Indiana arrive in Lancaster at the invitation of pastor Rev. Anthony Kaul. Mother Mary Augusta and Sr. Mary Stanislaus (Fr. Kaul’s sister) are sent to evaluate the situation and report back to their superior, Mother Angela. They decide favorably. Within a week, Srs. 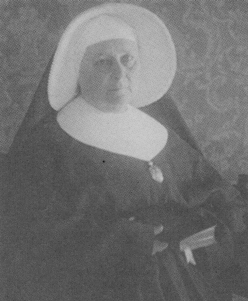 Mary Gertrude (Kuntz) and Mary des Victoires (Martin) are sent to St. Anthony’s to join Sr. Stanislaus in starting a school for the parish. Sr. Stanislaus also begins music lessons in the house where the Sisters lived at 518 East Orange Street. This music conservatory will eventually become Sacred Heart Academy, another important institution in the his-tory of the parish. Also in August, Fr. Kaul’s sister, Mary Kaul, presents the parish with the ﬁrst bell to be mounted in the church tower. 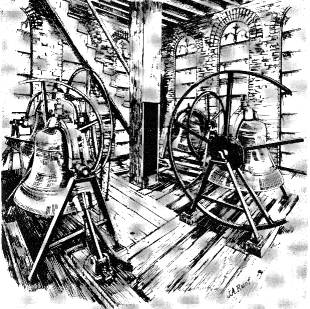 It is to be the smallest bell in the tower, and has been purchased from Joshua Register and Son Bell Foundry in Baltimore, MD for $299.30.